NEW YORK (Reuters) - Apple led a rebound in technology shares and boosted all three major U.S. stock indexes on Thursday, while trade worries eased after China welcomed new talks with the United States. The Dow inched closer to its all-time high hit on Jan. 26, closing at its highest since Feb. 1 and just 1.8 percent below the Jan. 26 close. The S&P 500 and the Nasdaq had already moved past their January peaks to record highs in prior weeks. The S&P technology index <.SPLRCT> climbed 1.2 percent on the day, its biggest percentage gain since Aug. 2, boosted by Apple's <AAPL.O> 2.4 percent gain. The timing of a new round of trade talks remains unclear and President Donald Trump said the United States was under no pressure to make a deal with China. 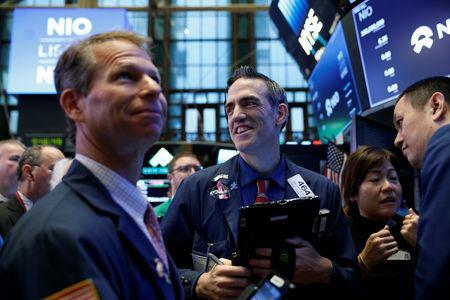 "Stocks already got a boost yesterday when investors got word the Trump administration had reached out to China on trade talks," said Burns McKinney, portfolio manager at Allianz Global Investors in Dallas. Also, he said, "the inflation numbers came out lower than people had expected. That's a positive because it gives the (Federal Reserve) cover to maybe move slower in raising interest rates, which is good for equities." U.S. consumer prices rose less than expected in August and underlying inflation pressures also appeared to be slowing, a report from the U.S. Labor Department showed. The Dow Jones Industrial Average <.DJI> rose 147.07 points, or 0.57 percent, to 26,145.99, the S&P 500 <.SPX> gained 15.26 points, or 0.53 percent, to 2,904.18 and the Nasdaq Composite <.IXIC> added 59.48 points, or 0.75 percent, to 8,013.71. On Wednesday, the Trump administration invited Beijing for a new round of talks, even as Washington prepared to slap tariffs on $200 billion worth of Chinese goods. The trade-sensitive industrial index <.SPLRCI> rose 0.5 percent. Caterpillar <CAT.N> was up 0.9 percent and Boeing <BA.N> rose 0.6 percent. Shares of Home Depot <HD.N> slipped 1.2 percent, Lowe's Cos <LOW.N> fell 1.4 percent and Beacon Roofing Supply <BECN.O> dropped 5.9 percent as Hurricane Florence, which began lashing coastal North Carolina, was downgraded to a Category 2. The S&P consumer staples index <.SPLRCS> dropped 0.4 percent as shares of Kroger <KR.N> weighed on the sector. Kroger slid 9.9 percent after the supermarket chain's same-store sales missed estimates as customers were put off by changes in how it stocked merchandise. Chipmakers bounced back from a slide on Wednesday, with the Philadelphia semiconductor index <.SOX> up 1.2 percent. Qualcomm <QCOM.O> rose 4.0 percent after it said it would buy back about $16 billion of its stock. Late in the session, a Republican-led panel in the U.S. House of Representatives voted to make permanent individual tax cuts from Trump's 2017 tax overhaul, a move seen as a way to help Republican candidates in the November congressional elections. Advancing issues outnumbered declining ones on the NYSE by a 1.41-to-1 ratio; on Nasdaq, a 1.09-to-1 ratio favoured advancers. The S&P 500 posted 61 new 52-week highs and 2 new lows; the Nasdaq Composite recorded 120 new highs and 59 new lows. About 6.7 billion shares changed hands on U.S. exchanges. That compares with the 6.1 billion daily average for the past 20 trading days, according to Thomson Reuters data.